The Cyrus Cylinder maintains a record of Cyrus the Great's religious and political tolerance. Listen to Suzette Grillot's conversation with Iranian-American filmmaker Farzin Rezaeian. The development of cities, urban planning, historical antecedents to modern-day professions, and tolerant, inclusive government policies in ancient Mesopotamia are important reminders to governments and global leaders today, he says. Rulers of ancient Iranian empires, such as Cyrus the Great and Shah Abbas, provide examples of incredible religious tolerance, compassion, and moral code. Farzin Rezaeian is the Iranian filmmaker behind Iran: Seven Faces of a Civilization. When he was six years old, he received a slide projector and has been working with images and film since. A book featuring reconstructed monuments from Iran's past accompanies his film. World Views is a partnership between KGOU and the University of Oklahoma’s College of International Studies to bring internationally-focused reporting and interviews to listeners in Oklahoma and beyond. Help support these efforts with a donation online. SUZETTE GRILLOT, HOST: Farzin Rezaeian, welcome to World Views. FARZIN REZAEIAN: Thank you very much. Thank you for having me here. GRILLOT: Tell us a little bit about your background. You're from Iran originally and became a documentary filmmaker, but tell us a little bit about where you come from and how you made your way to becoming a filmmaker. REZAEIAN: Actually, it was in 1972 when I first came to the United States. I was only twelve years old then. I then went back, and came back [to the United States] again. I did my high school in Chicago, and college and everything. My aim from the first... I would say when I was six years old, I received a slide projector as a birthday gift and I'd always wanted to do something with images. For the past, let's say 25 years I've been doing films. For the past 12 years, our focus shifted to cultural and historical films with companion books, and these books are quite different from regular books in that we have transparent overlays of the reconstruction of monumental buildings, historical buildings, which are superimposed on the original or present ruins. You can go back and forth and see how they look in their hey-day. GRILLOT: I've seen your project and it's very interesting, but it's also very interesting that from an early age you figured out what you wanted to do - become a documentary filmmaker. But that can take a number of twists and turns. You could be focusing on any subject and yet you chose to focus on the subject of Iranian history. With your own particular background having studied sociology, political science, and social sciences, you really tend to become a historian, of sorts, right? You're telling us about 7,000 years of Iranian history. What is it that took you in that direction? Why tell the history of Iran, and particularly 7,000 years of history? REZAEIAN: First of all, Iran has a very fascinating history. Unfortunately, it has been forgotten, so this culminate period about 2,500 years ago we have so many things that we could talk about. There was an exhibition at the British Museum with the same title: The Forgotten Empire. That is exactly the case. The name was quite right, because there has been so much contribution coming out of that part of the world to the whole humanity. The idea of international law, for instance, the beginning of human rights as it's mentioned in the Cyrus Cylinder -which is on tour in the United States. This goes back to some 2,500 years ago, five hundred years before Jesus Christ was even born. Unfortunately, we don't hear about it. That's the reason that I try to somehow bring that into life and into picture, into images, into moving pictures as well. GRILLOT: Any idea why this has been forgotten? You have written about it, others have written about it, you've done a film about it. Why has it been forgotten? Have the Iranians not been key at putting down their own history? REZAEIAN: I think there are so many reasons. One is that the glow of the Greek and the Roman civilizations does not necessarily permit other nations to come forward. Other than that, because it has been mainly European oriented, you know. Orientalism is something quite new starting from the nineteenth century and moving forward. Having said that, you are quite right. Many Third World countries and especially Iran have not necessarily used the right means in order to introduce our culture and our civilization. GRILLOT: Well, you've done, as you referenced earlier, the book. The overlays that are there in terms of reconstructing these major monuments are from seven key periods in Iranian history. Tell us a little bit about those monuments and why they are so significant. REZAEIAN: First of all, the process that we have is through the collaboration of something like 80 scholars throughout the world, so this is not something that I have done personally by myself. We have had the collaboration of many scholars from many universities and museums scattered around the world. Secondly, the significance of these seven periods is that they have introduced so many things in that certain period. For instance, the first chapter, the first part that we cover, introduces us to the beginning of civilization. Civilization, as you know, comes from civilis, the Latin word civilis, which means city. Urban planning, urban living started in that part of the world back in something like 4000 BC. That's six thousand years ago in Mesopotamia and what is now called Iran. That's a very significant point for all humanity to move from farming and food gathering to settling down in cities. The introduction of cities means so many other things that came afterwards - writing, for instance, and accounting. There's an exhibition at the University of Chicago that is very nice and shows us so many jobs that are presently known to us -such as a judge, a policeman, a potter.... So many different things that all originate from that part of the world. They used to exist even 6,000, 5,000 years ago. It's very nice to make this comparison and say they did have doctors, or in another sense, a medicine person and many other things. So that's the first part. The second part, again, is about the culminate period which is the introduction of a very tolerant government. Although they controlled something like 23 different countries of that period, you know - which are considered to be a world empire as the Greeks called it - nevertheless, they were very compassionate. They gave autonomy to all these different governorships or countries, which they controlled, and there was one ruling law called dāta, which the word data is derived from and which we use today. This word governed the whole empire, as it was called. Nevertheless, they were free to choose their religion, their language, their culture, their education, and so many other things, which is quite peculiar, you know, if you consider that this is 25 centuries ago. Later on, of course, the other chapters consider many significant points that are also interesting for our viewers and the people who see the books as well. GRILLOT: Well, some of those interesting points - you reference the specific physical monuments, the actual architecture, and the way in which this civilization, this empire looked at that time, but you also reference the great figures of Iranian history - Cyrus the Great all the way to Shah Abbas. Tell us a little bit about some of those key leaders and what it was they were known for. Why were they significant? REZAEIAN: I'm very glad that you brought up these two names, because it's very interesting to know that Cyrus the Great's name has been mentioned 22 times in the Bible. The book of Isaiah calls him the shepherd of god, the anointed one, messiah, maschiah in Hebrew. It's very interesting to see that a non-Jewish person, a man from Persia, is called the shepherd of god. What he had done was to.... Let us just look at this picture. We're talking about 25 centuries ago. We're talking about the place where people had so many fights, so many battles. And after the battle, the conqueror would do anything he wanted, usually killing the men and taking the women as captives. Then comes Cyrus the Great. This is the only person in ancient history with such a character. You are familiar with Machiavelli's The Prince? Cyrus is quite opposite to Machiavelli's depiction of a prince. REZAEIAN: ...and crushing everything, everybody. So what Cyrus does, according to the Cyrus Cylinder, which was found in Babylon - there's a deposit underneath one of these buildings where it was found in the early 20th century.... 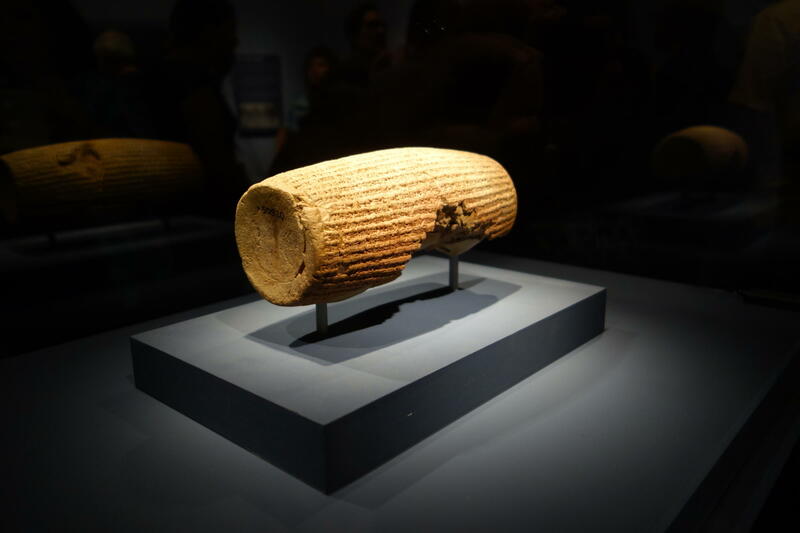 The Cyrus cylinder tells us that he not only freed the captives, but sent them back to build their own monuments, their own places of worship, and also helped them to rebuild their own gods and freely practice their own religious beliefs. This was quite new to the ancient world. Nobody had done this before. It's like today, in a democratic society, here in the U.S., it's not a big deal if the government is helping some other religious minorities to build their religious centers. But going back to that part of the world and that part of time when everything was quite different, it's very important to understand. Now when you come to Shah Abbas, you're talking about the 16th century AD, about 400, 500 years ago. And again, in his capital city, which was called Isfahan, Shah Abbas does exactly the same as Cyrus the Great, which was very nice. He helps the Christian minority over there, who are Armenians mainly, to build their own churches. They had 16 churches. You're looking at the medieval city, which was not that big, but in a medieval city with a Muslim population you have 16 churches 500 years ago. That's very interesting, and he even helps them financially to build their own church. And he also participates in the Christmas parties -not parties but ceremonies let's say - at that time. It's quite different, quite peculiar. Unfortunately, not too many people know about this. GRILLOT: So very interesting history then that Iran has, a very long history. To come to conclusion, what is it about Iran's history - you're telling us these wonderful stories and showing us these wonderful images - but what is it that's really instructive about Iran's history, that maybe helps us understand Iran today? REZAEIAN: The key word is tolerance. And as President Obama in his Persian New Year speech mentioned, from an Iranian poet by the name of Saadi, who lived about 800 years ago... Saadi tells us that all human beings are like part of the same body, and if one limb is injured the whole body is actually injured. So it is very good to live side by side in tolerance and in freedom. This is the main topic and the main message that one could get from the whole Iranian literature and culture. GRILLOT: So perhaps instructive not only to the United States and other countries but to Iran itself today. REZAEIAN: To everybody, to everybody. It's a multinational, an international message. And the good point is that this message will stay the same for years to come and it's been the same for the past 800 years after Saadi mentioned this poem. It's universal and it's for all of us human beings. GRILLOT: Well let's hope that those lessons of tolerance and freedom are learned by all. Thank you so much, Farzin Rezaeian, for being here and for sharing your project. REZAEIAN: Thank you very much for having me. It was a pleasure. Thank you.